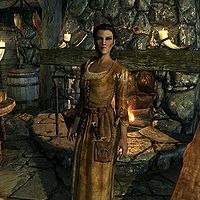 Camilla Valerius is an Imperial pawnbroker, and the sister of Lucan Valerius, the owner of Riverwood Trader in Riverwood. If Lucan dies, Camilla will take over the store. She is involved in a local love triangle as the love interest of both Faendal and Sven. She may be married if her disposition towards you is high enough, giving you full access to the Riverwood Trader. She wakes up at 7am for a one-hour breakfast, then starts working at the store for ten hours. At 6pm, she heads to Sleeping Giant Inn for a drink and chats with other patrons. She stays there until 10pm, when she goes outside for a walk around Riverwood. She returns home at 12am to sleep. She wears a belted tunic and a pair of boots. She carries a key to Riverwood Trader as well as common items and gold. She wields an iron dagger. Camilla: "Well one of us has to do something!" Lucan: "We are done talking about this." Camilla: "Well what are you going to do then, huh? Let's hear it!" Lucan: "I said no! No adventures, no theatrics, no thief-chasing! Oh, a customer. Sorry you had to hear that." Camilla: "So this is your plan, Lucan?" Lucan: "Yes. So now you don't have to go, do you?" Camilla: "Oh really? Well I think your new helper here needs a guide." Lucan: "Wh- no... I.... Oh, by the Eight, fine. But only to the edge of town!" Camilla: "Now, if you're going to get those thieves, you should head to Bleak Falls Barrow, northeast of town." Camilla will then offer to guide you out of town. If you refuse, she will be upset: "Oh, really? You're just like my brother. Fine, but if you change your mind, I'll be right here." If you accept the offer, she will accompany you until the stone bridge to the north. She will make comments about the barrow, the thieves, and the claw as she directs you out of town: "Those thieves must be mad, hiding out there. Those old crypts are filled with nothing but traps, trolls, and who knows what else! I wonder why they only stole Lucan's golden claw. I mean, we have plenty of things in the shop that are worth just as much coin. Lucan found the claw about a year after he opened the store. He never quite explained where he got it. He's a tricky one." Somewhere in the middle of town, she will gesture towards the barrow and say, "We have to go through town and across the bridge to get to Bleak Falls Barrow. You can see it from here, though. The mountain just over the buildings." Once you reach the bridge, she will say, "This is the bridge out of town. The path up the mountain to the northwest leads to Bleak Falls Barrow. I guess I should get back to my brother. He'll throw a fit if I take too long. Such a child...." and walk back to her shop. After the golden claw is returned, she will be grateful to you, saying, "It means so much to us to have the claw back where it belongs. Thank you!" Otherwise, she will greet a male character with "You're a strapping young man. Don't be a stranger." and less amicably to females: "The men here like my attention, and I like theirs. Best know your place." She may also say, "You're not from around here. That makes two of us." and explain why she came to Skyrim: "I came here from the Imperial Province, to work with my brother Lucan. It got bad back in Cyrodiil. The war with the Thalmor ruined... everything. I came to Skyrim looking for a better life." She bitterly ends with "So what did I get? Another war. I just want to find a good husband, and start a family of my own." Camilla may still surprise you with gifts after you complete The Golden Claw and A Lovely Letter, saying, "This doesn't mean we're engaged or anything." (even if married). Camilla: "Lucan, we don't sell silver buckles, do we? One of the customers was asking." Lucan: "No, dear sister. We do not." Camilla: "Hmm. All right. Do you think... maybe we should?" Lucan: "That's really not at the top of my list, no. Please, Camilla, I need you to focus." Camilla: "Of course, Lucan. Of course. I was just, well... Never mind." Camilla: "We don't sell any imports from Summerset Isle, do we, Lucan?" Camilla: "Well, I was thinking... we should. We could stock all kinds of specialty items. You know, to cater to some of our more.... 'eclectic' customers." Lucan: "Dear sister, we talked about this sort of thing before. We sell dry goods, nothing more, nothing less." Camilla: "Okay, okay. Just trying make this place a little less... boring." Camilla: "Lucan, I was thinking we should have a grand sale. Lower the prices by half, maybe get some jugglers. We could attract lots of new customers." Lucan: "A sale? To attract new customers? Camilla, everyone in Riverwood already shops here. There are no more customers." Camilla: "Hmmm... Well, maybe we could go on a sort of trip. Take the wares on the road. Get some new customers." Lucan: "Camilla, really? You don't have better things to do? Because I could certainly find quite a few tasks..."
Camilla: "I know, I know. My head's in the clouds again. Just... forget I said anything." In the evening, Camilla may spend some time in the Sleeping Giant Inn. Depending on who is present with her in the inn, she may have conversations with two different people. Hod: "You need to choose between those two boys. It ain't fair to Sven or Faendal to keep tuggin' on their heart strings like that." Camilla: "It's bad enough my brother is harping on me to pick one. Don't you start too." Hod: "I'm just sayin' you should pick one to settle down with." Her gold is shared with her brother; if you sell to her, then her brother will also lose gold. If Lucan dies and Camilla takes over the shop, the bug concerning Lucan's high amount of gold also applies to Camilla. If you complete the Lovely Letter quest, she will retain the letter forever. If you marry her, Faendal or Sven may still visit her at your house occasionally (depending on whom you helped in the related quest). Even after you marry her, she may continue to thank you for returning the golden claw. This bug is fixed by version 1.3 of the Unofficial Skyrim Patch. Adopting a child with her may also fix it. If you marry her and have built a house with the Hearthfire add-on, she may not move. Furthermore, you will not be able to ask her to move anywhere else. ?